Go Ape! Treetop Adventure Tickets Contest – Enter to win 4 tickets to zipline, Tarzan swing, and jungle cross at Go Ape! 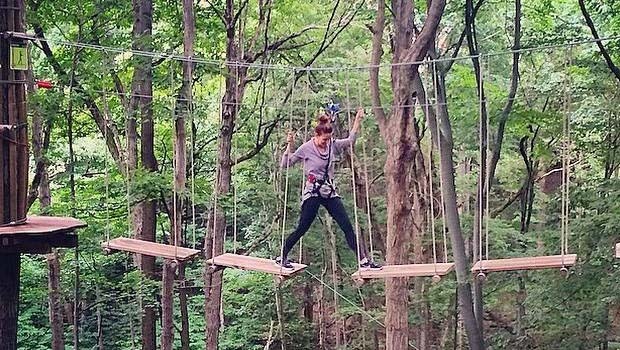 Treetop Adventure inside Stony Creek Metropark! Climb 50 ft platforms, cross 71 chasms, zipline more than 600 feet and explore all almost 3000 feet of course at Go Ape! e-mail me at lisa@oaklandcountymoms.com. Put Go Ape! Stony Creek SEPTMBER in the subject line and don’t forget to include ALL of your contact info (name/e-mail/phone #). Please let me know if you’ve completed steps 1-3. I’ll accept entries until Sunday, September 9, 2018 and draw/notify a winner on Monday, September 10, 2018. The winner will receive 4 Go Ape! Treetop Adventure at Stony Creek Metropark tickets to valid any day through the 2018 season. Winner will have their tickets mailed to them via snail mail so please include your address in your entry. Oakland County Moms is NOT responsible for lost mail or late delivery. The winner will be announced on this page Monday, September 10, 2018. Go Ape! Tickets include access to Tarzan Swing, Zip Line, and Jungle Crossing. Prices for 2018 are $58 for adults and young adults (16-17), and youth $38. Minimum age is 10 years of age to enter, minimum height is 4 ft 7 inches, and maximum weight for the course is 285. Buy tickets HERE. This Go Ape! Treetop Adventure Tickets Contest is brought to you by Oakland County Moms and Go Ape!